Great defensive efforts from both sides in the opening minutes saw attacks thwarted with attacking players pushed into touch at both ends. After patiently testing the Eagles line it was the Bulls who finally took the lead on twelve when Ethan Ryan passed inside to Ross Oakes for the centre to drop over the line, Bradford exploiting the overlap. Jordan Lilley was unable to convert from the touchline. Two minutes later the Bulls were in again when Rowan Milnes threw a dummy before passing out to Ryan enabling him to go down the wing for twenty to score, improving the angle as the Eagles failed to tackle. Lilley converted the try for a 10-0 lead. The Eagles opened their account on twenty-five when Josh Guzdek took a pass from Pat Walker and went between two weak Bradford tackles to ground over the line. The conversion was added by Walker, Sheffield back within four. Both sides had opportunities to score again before the interval but handling errors more than good defences saw the sides go into the interval at 6-10. With forty-eight on the clock, and the game temperature raising, James Green maliciously swung the elbow in the tackle and after a quick discussion with his co-officials, referee Griffiths brandished the red card. Despite being a man down, the Bulls were still competitive in an evenly matched game but on sixty-five James Glover zig-zagged his way between the Bulls defenders after a superb break from Ryan Miller. Pat Walker added the conversion for 12-10. Jy Hitchcox lost the ball in the act of scoring on sixty-nine, the Eagles surviving. Within a minute Brad Knowles took a short pass from three metres and crashed over. Walker added the conversion for 18-10, the one-man disadvantage was starting to show. Jordan Lilley was sin-binned on seventy-eight for opening his mouth to the referee, the Bulls finishing the game with eleven men. Inside the last sixty seconds, Joel Farrell bust the Bradford line and grounded by the sticks after hitting a short pass at speed. Walker added the conversion for a brilliant 24-10 win. The two sides flew into one another from the opening whistle, neither side asking or giving an inch. 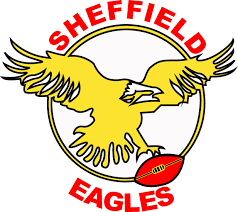 On one of the occasions that the tempers boiled over, James Green saw red for a reckless act which ultimatly cost the Bulls the game and saw the Eagles soar to the top of the Championship, a great start for one of the Betfred Championships underdog sides. Eagles: Guzdek (T), Millar, Glover (T), Crookes, Blackmore, Walker (4G), Thackeray, James, Burns, Knowles (T), Farrell (T), Davies, Brown. Subs: Makelim. Broadbent, Esslemont, Burns. Bulls: Pickersgill, Hitchcox, Evans, Oakes (T), Ryan (T), Milnes, Lilley (G, SB on 78), Kirk, Wildie, Crossley, Farrell, Michella, Magrin. Subs: Flanagan, Green (SO on 48), Garside, Krasniqi.